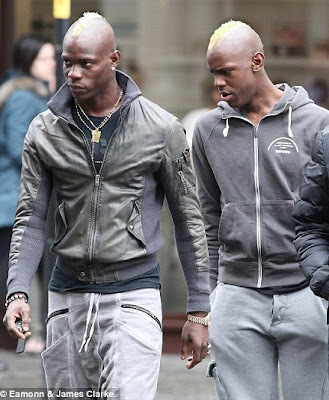 Man City striker, Mario Balotelli (left) and his younger brother Enoch (right), seen out and about in Manchester yesterday in matching platinum blonde mohicans and matching outfits. MATCHING OUT FIT.. SO WAT? They both look gay. Smh. They look rather foolish! Shave it off and start again. Dem no resemble like dat, na only deir akparimagongo head resemble jor. scary OMG there is two of him!!! Propably,they are from sango worship family! Is Enoch too a footballer?.i think Balotelli need to chilled and take his career seriously!. Not a fan of the hair, guess it comes with the profession. Btw its Mohawk not mohicans. Apart from the mohawks (not my thing) and general craziness (too much money) .... these 2 guys are hot, hot, HOT!!! Dem both look like saddists. Look at their faces. 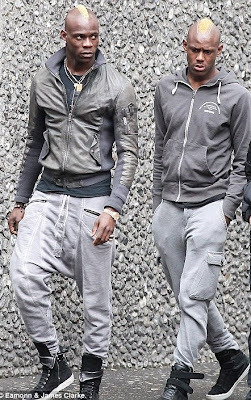 If these guys were not rich, they would have been successful criminals - armed robbers. Lol. They both look stupid... like two Monkeys looking for some banana... can't one be different... Why the attention? His younger brother as in twin brother, bcos can't tell them apart. Ok, y r they dressed like they are tins??? Really like brother like brother, they could pass for twin brothers. See the resemblance. Ishi nbaka runs in their obara. It's all in the blood. What more can I say? Y'all have ur own attitude... Let him cope with his own. "Why always you, Super Mario"? LOL! He's always been one of my favourite characters, right from his Inter days. Babes the thing shock me too. Its reported as mohican on different international websites too o. I tot it ws mohawk. I had to check b4 them go call me mumu for here if I ask.